From the author: This is not a typical interview, where questions are being asked by an “objective” journalist. This is more of a discussion or an exchange of ideas, where the person asking questions has an established critical opinion, in this particular case – quite adjacent to the interlocutor. It is my point of view on dialogue between critics and artists. 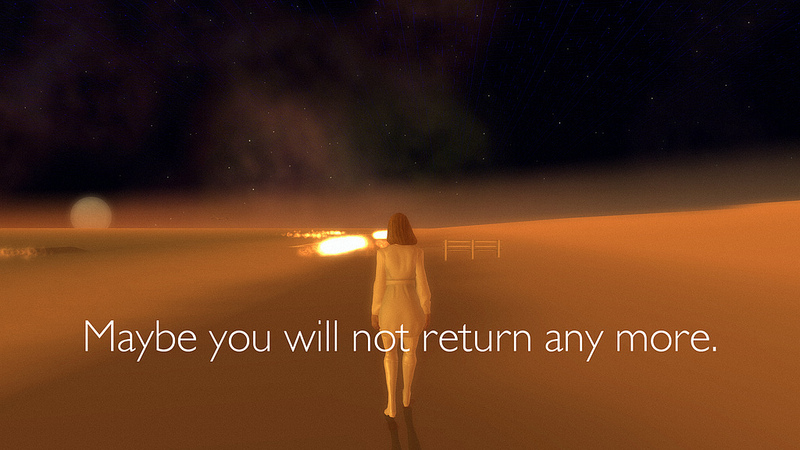 Dawid: You have been making distinctive and intriguing games for almost a decade now. What had been your main motivation to take the risk and enter the land dominated by a simple entertainment with artistic ambitions? Did you decide to go into games mostly because of admiration of some previous achievements or more as a rebellion against the conservatism of games? Has your motivation been changing? Is it still so much worth to make games as it seemed back then? 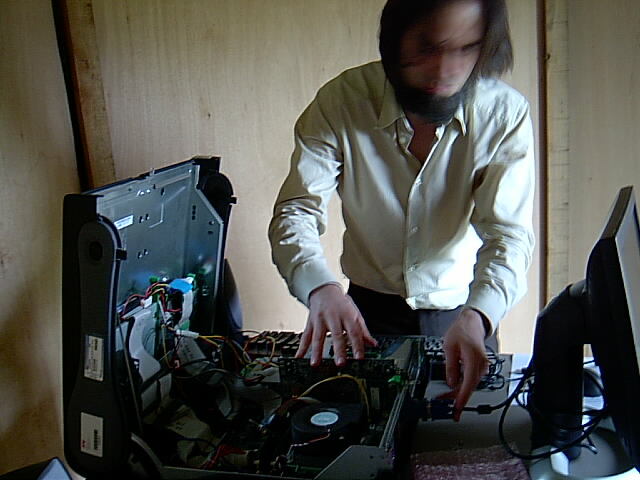 Michaël: We started using computers as an artistic medium and platform for distribution when the first graphical web browsers appeared in the mid-nineties. Before that, we had been using computers solely as tools, in support of works in other media. Our decision was motivated mostly by the direct access to a wide audience that the internet offered, as an alternative to the curated world of galleries, museums and festivals that could only give us access to a specific narrow audience. Despite of having played and enjoyed videogames, our main inspiration back then was CD-ROMs (Alex Mayhew’s “Ceremony of Innocence”, Peter Gabriel’s “Xplora1” and “Eve”, The Residents’ “Freak Show”, „Gingerbread Man” and “Bad Day on the Midway”, Laurie Anderson’s “Puppet Motel”, Gerald Van Der Kaap’s “BlindRom”, etc). We thought we would make websites that felt like CD-ROMs, only easier to access because they didn’t require physical transportation of objects. We designed websites for clients as well as personal work. 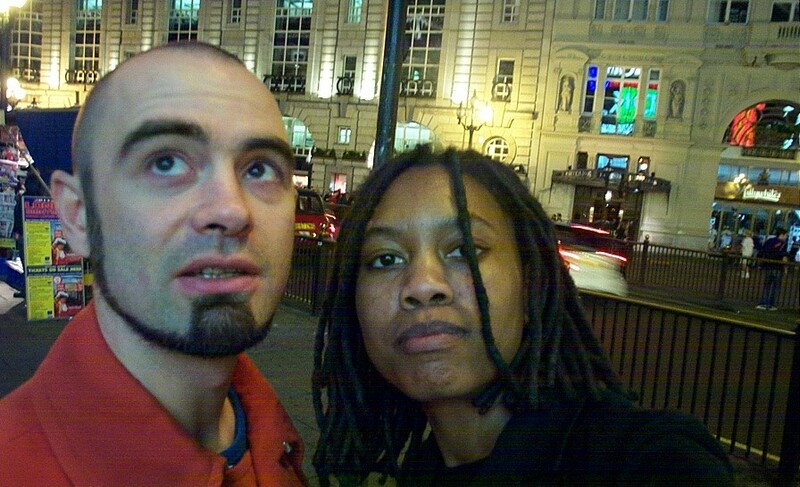 First separately, Auriea in New York and I in Belgium, and as of 1999 together. 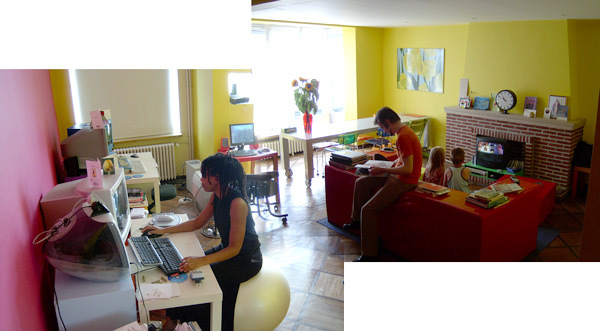 We kept the distinction between our commissioned design jobs and our art works low. We believed in a sort of new art that would transcend the limitations of the old contemporary art, in part by being more broadly accessible but also by being interactive. We felt interactivity offered us a means to share something with other people on a less than conscious level, a way to circumvent the objections of the intellect. We created hundreds of websites, many of which are now broken due to „progress” in technology. When Web 2.0 came along, we left the sinking ship. Our dear World Wide Web had turned into a shopping mall where interactivity was reduced to the fastest way to get to what you want, which was invariably non-interactive things like text, images and videos. Not much has changed since then. Floating in the ocean, clinging to our raft of interactivity-as-artistic-technique, we looked around for land, or at least a ship where we could sneak on board. Videogames looked interesting. They were interactive, had plenty of graphic potential, and while most were not actually online, they were still being distributed to a wide audience. So we decided to take a closer look. We had been playing games on and off and there were explicitly game-like elements or references to videogames in many of our web pieces. In „I Confess”, I mimicked Doom’s interface to ask questions about what it means to be an artist. In „Eden.Garden” we created a virtual garden in which 3D scans of our naked bodies dance around making motion-captured Quake moves. In The „Godlove Museum’s Numbers”, we slap each other in a layout derived from „Tekken”. And in „The Godlove Museum’s Exodus” there’s a little game in which you shoot down planes to find the one that carries your lover. But it wasn’t until the „web crisis” of the early 2000s that it dawned on us that we could actually probably make a game ourselves. Back then, independent games development was mostly limited to people making games as a hobby. It wasn’t really an option for the kind of work that we wanted to do, which was inspired by „Myst” and „Tomb Raider” and „Silent Hill”. We did a two year post-graduate research term at the Jan van Eyck Academy in Maastricht to investigate videogames. Through reading and visiting games conferences, we learned about this strange way of financing in which a publisher would give you an advance on the future sales of the game you wanted to make. And since we had no interest in making money with games, we decided to try and woo publishers to invest in us. So we pretended to be a company. I let my hair grow a bit so it could be parted. We printed business cards and infiltrated the games industry. This plan did not work. But in the course of it, when we realized that we needed to show these people what we were trying to make, we found our way to arts funding for the first time in our careers. With the aid of the Flanders Audiovisual Fund (which subsidizes film production in Belgium), we were able to create prototypes and a so-called „vertical slice” of our first game design „8”. While visiting games conferences we noticed that the videogames industry was in some sort of identity crisis. At that point, early 2000s, it was becoming clear that videogames might have the potential to grow into a real medium. But there were a few serious problems. The audience for videogames was very narrow and homogenic. The idea of women playing games was very exciting and new back then. There was frustration with the quality of the stories in videogames. And many developers and academics argued that stories were a crime. There was also frustration with the rising cost of using the technology to create photo-realistic simulations. And so on. Fresh from the boat with our bright art heads, we had answers to all these questions. The problem was, the games industry had no interest in our answers. Or any answers. It loves asking questions. But it doesn’t have the courage to answer them. There’s always something stopping them. And it’s always the same thing. And not much has changed since then. Ten years ago. So, we were never really deeply interested in videogames as such. We saw a technology that we could use for our art and a platform that we could use for distributing our art. All we needed to do was convince whoever would allow us in that what we were making would appeal to their audience. Because when we started investigating videogames, we quickly realized that there were certain things in videogames that we would simply not have in our own work. We felt that rules and missions and challenges were keeping us from truly enjoying the creation of the artists. We didn’t really understand why developers insisted on including all these things that were obviously ruining such a powerful artistic medium. So we thought we were being clever by saying that we would make videogames that would not stop people from enjoying them. Videogames that were simply about the environments and the characters. With simple interfaces and controls designed to explore and interact with them. It was only much later that we realized that most gamers actually enjoy the layer of gameplay that we could only see as an annoying obstacle. And then we realized what it was that was stopping videogames from becoming a medium, what it was that prevented the game industry from embracing the logical answers to their relentless agonizing questions: they really love playing games. We were baffled. Not that we did not enjoy games ourselves, once in a while. All humans have, for centuries. What we were shocked by is that people would actually purposefully keep a medium that we saw as the most powerful ever created from developing its enormous potential simply because they like playing games, because they were having fun. You know that high pitched feedback that you hear when your avatar gets shot in a first person shooter? I don’t think we have fully recovered from this discovery yet. We are struggling to make sense of our situation. And trying to figure out what to do with this technology and if it still makes sense to be involved with this industry. Because it’s not like we haven’t been successful. An opening has been created in the games community where different kinds of experiences are welcomed. Not that anyone is giving up on gaming. But people are adding more variety to their diet. We may have lost most of our hopes for videogames to become a real medium, like literature, theater of film. But maybe there is a small space left where our work can exist. And maybe we owe it to humanity as artists to be active in this small space. To at least offer people a choice. I don’t see what else we can do. The one positive evolution is that we are not alone anymore. Videogames have been made that downplay the competitive aspect of formal gameplay in favor of simply entertaining people. Several developers have emerged that use this medium to make works that are actually about something. The game fanboys are as hysteric as ever, depressingly so, firmly dedicated to preventing all change, keeping everyone with dissident opinions in line. But a niche has been created. We are not alone anymore. We no longer have to refer solely to „Ico” and „Silent Hill 2”. We now also have “Dear Esther”, and “Dinner Date”, and “Strange Rain”, and “Proteus”, and “Journey”, and “Datura”, and “Kairo”, “Flight of the Fireflies”, “Amnesia”, “Trauma”, and so on. And these developers and artists are not stopping. They are all working hard and creating work that elevates the medium. We may not have reached the level of literature yet, and maybe we never will, but at least we’re getting closer to graphic novel. And that’s something. Dawid: In my words then, it was excitement and hope rather than rebellion that has driven you, at least at the start. It was different to my decision to start writing about games, since there was more frustration at the onset. Earlier, just like you, I was excited abort some of the games of the 90s – early 2000s. I thought it is a beginning of something serious. But suddenly a crash came. Especially in the mid 2000s the dominance of action and simplicity was overwhelming. With this, quality and maturity of writing about games decayed rather than progressed. Funny enough, it were some features of „Web 2.0” that helped: Non-profit game blogs and sites emerged, digital distribution happened at those web „shopping malls”. And I have also decided to do a little something to not allow the decline to just go on and have shown my support for game artists actively. But, even as better times have come along, I feel game critics are still in the midst of similar identity crisis you mentioned for games. Many of us still cannot decide what’s more important, we often have poor knowledge of art and sensitivity outside of games, we want to measure the meaning of games by other rules than rest of the world. Lately on our site Jawne Sny, your blognote about artistic superiority of „Dear Esther” over “BioShock” sparked comments like „a major mistake”, „an intellectual faux pas” – and conclusions that we should similarly value both titles, as they both have their distinct emotional and aesthetical impact. How you see this contrast – of artistic superiority and inferiority in games? Is there still a room for „high” and „low” arts distinction in the contemporary media? Michaël: This is not a discussion about high and low art. It’s a discussion about art and not art. Consumer products are not art. Games are not art. Works of art do not have a registered trademark after their title. Works of art are created by authors, not corporations. It’s very easy to spot the difference. Everybody can write what they like of course. And since most writers about games are rabid game fans, there will be no shortage of writing about how much fun they are having in some games and how little in others. But please do not call that criticism. Or even journalism. To encourage videogames to evolve as a medium, and not remain simply a hobby or a pastime, it would be helpful to have the sort of criticism that can make distinctions. Embracing everything stifles change. In a climate where big budget corporate blockbusters invariably receive great „critical” acclaim, it is not easy for sincere authors to remain motivated to create art in this medium. Especially since art usually doesn’t sell well, at least not in a mass market. We need a sort of criticism that can make a distinction between commercial entertainment and sincere works of art created with integrity. Even if the latter may sometimes not be as slick or fun as the former. We need to recognize at least the efforts that some authors are doing to make something more substantial in this medium, something that is actually important. Also because these authors need to hear sincere opinion about their work in order to continue and improve their craft. Despite their age, videogames are still young as a medium. We need to be experimenting. We need to figure out what we can do with this technology. If such activity is supported by critical writing, new and wonderful things can happen much more quickly. But if all writing about the medium only celebrates the big commercial successes, nobody will be motivated to explore. If most writers don’t recognize the difference between a deep artistic experience and a shallow bit of fun, authors are actively discouraged from choosing this medium for their art. Videogames can either continue to be a nerdy hobby that is not relevant to culture, or it can grow into a medium that rivals literature and cinema in breadth and depth. And critical writing can make the difference. Dawid: Maybe I have a slightly more liberal definition of art, since for me every activity done with the purpose of causing emotions in the audience and accepted by its free will, is art. But you are right that the (emotional) substance per se has to be put first – and not the profit, as in commercial entertainment, nor power or influence, as in politics. Maybe the developers of „BioShock” did have intentions to produce interesting feelings, but they have failed to put it first, making a shooter, with unavoidable, emotionally primitive action as the front page. Because that sells. „Dear Esther” was made to advance the medium into novel emotional grounds, but even that wasn’t forced. Unlike in „BioShock”, you can walk through the game just admiring the visuals, for instance. Paradoxically, there is more of a sandbox gameplay in “Dear Esther”, because it is the sandbox of feelings and interpretation! So my personal recognition of the superiority of „Dear Esther” comes from its purpose and the quality of emotions, the same, by the way, as the superiority of „BioShock” over most shooters. To judge games in this way, however, the audience must go beyond, look at games from the perspective of other art achievements, leave the shoes of fans. From the post-mortem of your biggest game to date – „The Path” – written for Gamasutra, I remember in particular how disappointed you were that it had been very hard to access the non-gamer audience. And now you have released „Bientôt l’été”, the more „not-gamy” title than „The Path”. For what kind of people is „Bientôt l’été” meant? Do you still want to reach outside the gamer community? Any new ideas how to do that? Michaël: „Bientôt l’été” lies far more in the vein of „The Graveyard”, „Fatale” and „Vanitas” than „The Path”. In the sense that it is created as an artistic exploration with not too much concern for the audience (in as far as one cannot be concerned with the user when working with interaction, of course), while „The Path” was a conscious attempt to reach a wider audience. 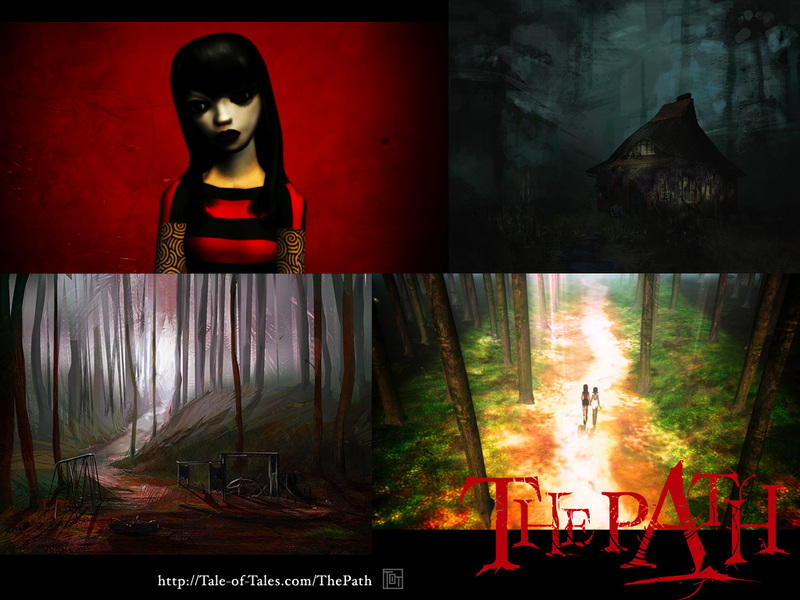 We had indeed hoped that „The Path” would attract more attention outside of the games community than it did. But we had also completely underestimated the amount of attention it received within. So, while we still think that videogames have the potential to become a medium for everyone, we have become a bit more modest about how much we can contribute to this as a small studio. Instead of trying to change non-gamers into gamers, we are now hoping to turn gamers into non-gamers. „Bientôt l’été” is not a game. 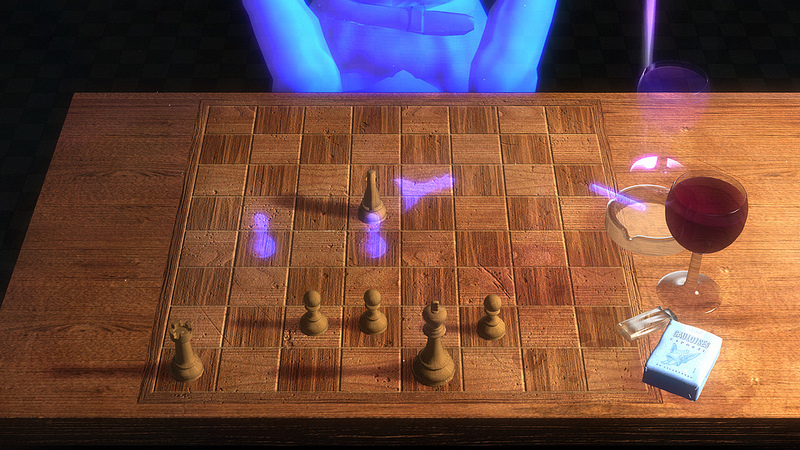 It is so confident not to be a game that it features a game -chess- as part of its content. This is a major milestone for us. It is the first videogame we have made that is no way -not even mockingly- a game. It is completely serious, and contains no irony. It is simply a lovingly crafted, sincere attempt at creating deep beauty. So „Bientôt l’été” is for everyone! Gamers or non-gamers. It’s for people. But as with all art, of course, not everyone will enjoy it equally. A certain compatibility is required. Dawid: „Bientôt l’été” apart form the exploration, includes also the „multiplayer” component: Sitting at the cafe’s table with a random person (or a bot program as the less pleasant alternative) and having a „conversation”, using only quotes form Marguerite Duras’ works, which largely inspired the game. 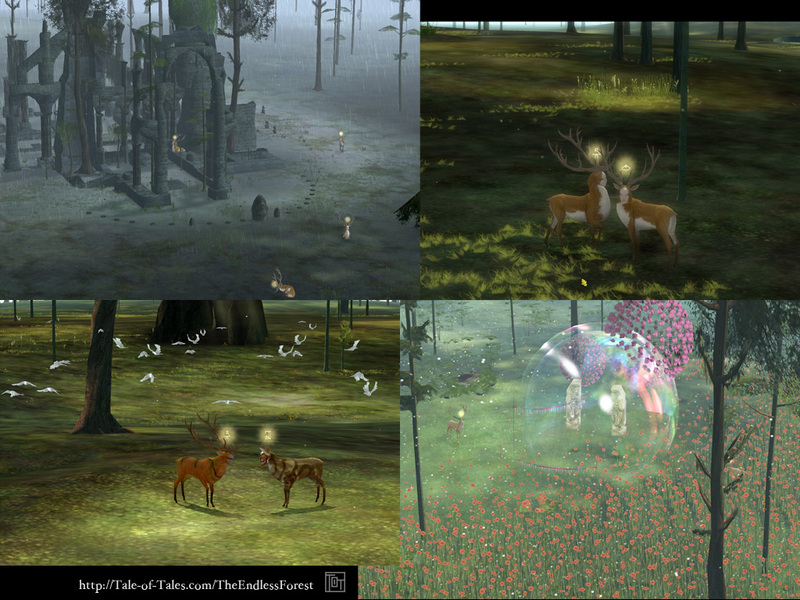 It is not the first time you include such a component, as in „The Endless Forest” you allowed the online audience for perhaps a little more interaction. But apart form that, I think we both share a critical opinion about most multiplayer game experiences, that provide addictive gameplay and shallow interpersonal relations. 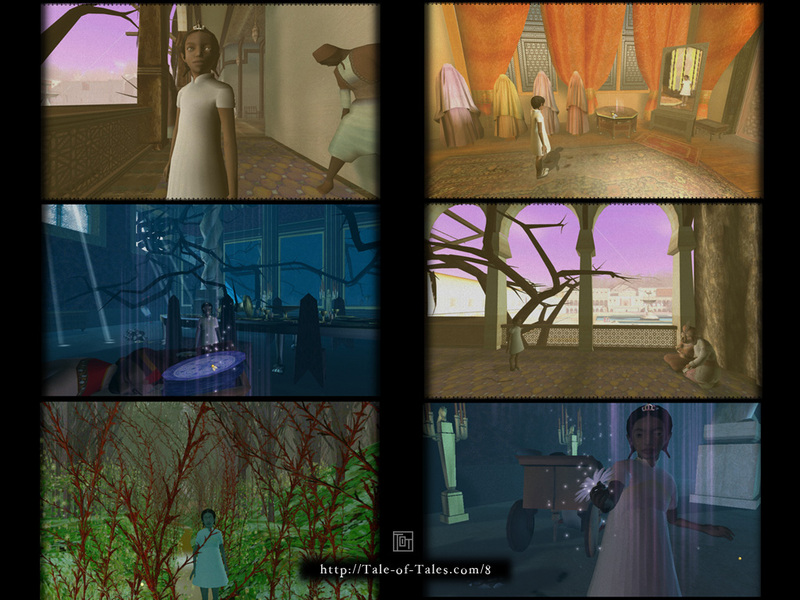 Looking at the above mentioned games by Tale of Tales or „Journey”, however, there seem to be alternatives, but they involve elimination of direct chat options, knowledge of other peoples’ nicks etc. Isn’t it a paradox that reducing freedom of interactivity seems to be the way to achieve more subtle in-game online contacts? Does online experience have future in interactive art? Do you plan to experiment more with this component? 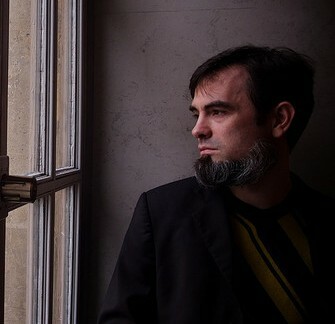 Michaël: The reason why most multiplayer videogames are the way they are is that they are games. And especially games as seen through the eyes of engineers. Games as objects, as programs, as systems. And not as contexts for people to spend some time with each other, for instance. But if one approaches the interactive medium directly, without the baggage of formal games, one almost automatically comes up with different ideas. If only because the current formulas are so complicated and far fetched. So even though I know Thatgamecompany was inspired by „The Endless Forest” when making „Journey” -we are good friends- it is really not so hard to come up with such ideas. One simply needs to sit down and think about people and how they interact with each other. And then perhaps observe the players of the design and draw conclusions. The quality of an interactive piece should not be judged by the amount of interactivity it includes but by the effect the piece has on its users. As a general rule it’s safe to assume that the more effect can be achieved by the less design, the better a piece becomes. Because it’s about people, not about systems. We need to create space for the player. Most game designs seem to be obsessed with continuously giving the player something to do. Multiple things at once, often. The player is always busy. Busy doing things the designer tells them to do. There is hardly any time to really enjoy the creation. You’re always on a quest, always moving forward, always going after some goal. I assume that to some extent this is by design. Games are often played for distraction. So if the player’s mind is fully occupied with game activity, everything else in their lives can be blocked out. I can imagine that this can have a therapeutic effect on troubled souls. But for the rest of us who don’t suffer from acute depression, it is actually nice to be confronted with our own thoughts and feelings once in a while. And we need time for that. Much like architecture, the focus of good videogame design is the spaces it creates, not the walls, windows or doors. It’s the empty spaces in which people can walk, sit, talk, think, pray, etcetera. I do love the idea of multiplayer games. It’s nice to feel that contact with another player. Even if it is remote or asynchronous. Sadly, multiplayer interactivity is quite difficult to implement. And for artistic videogames, it’s often a question whether it’s even worth the effort given how small the audience for such pieces is. We do have a big ambitious design for a multiplayer game in the back of our minds. But it’s so experimental and grand while at the same time conceptual and minimal that I doubt we will ever find sufficient funding for it. The content of the piece is also very severe. So much so that I feel I will only be able to do it justice when I am much older. Our background being in 1990s web design, the era of „cyberspace”, connections between „internauts” are very dear to our hearts. So we will probably not be able to resist including such connections in future projects. Internet connections between people are not only part of the play in „Bientôt l’été” but also part of its content. In some way, „Bientôt l’été” explores the utopic ideas about connections in virtual spaces that we had back then. The remote space station where the game takes place can be seen as a metaphor for any computer connected to the internet. We reach out to each other through the wires. Contrary to the current situation, perhaps, most of the time, back then, we didn’t know who the other people were. But that didn’t matter. It was about contact with other living creatures, no matter who or where they were. And we realized that the contact itself was more important than to know who we were contacting. And this is where cyberspace meets Marguerite Duras. Her work often seems to focus on love as an almost independent entity, independent of the humans that feel it, or exterior to them. When we embrace our lover, we also embrace love itself. Maybe we have an affair more with love than with our lover. Dawid: Making such an interactive art makes you not only abandon the typical way of game design but, as you have mentioned before, you may be forced to live without the industry’s typical publisher-based funding. In the past I had many fierce discussions on the Polish internet proposing that the games more ambitious emotionally or subjectwise, could be founded by the state/non-profit institutions. The arguments against were obviously that one’s taxes and donations shouldn’t be used to support something the one doesn’t want to buy. Since the establishment of the state’s Polish Film Institute (2005) however, it is hard to negate here the positive influence such institutions – with all their flaws – may have on the supported medium’s art landscape. You have got experience with similar funding for many years now, though recently you have ran into some trouble with maintaining the support for „The Endless Forest”. How do you see the past and future of art-supporting institutions for making interactive art? Do you want to go for bigger budgets in the future, are there any alternative sources for authors such as Tale of Tales? What about crowdfunding? Michaël: First of all, money is a solution for a problem. A solution we have invented. Money is not found in nature. It is not part of life. It is a means to an end. And it is only because of the way in which we, humans, have organized our societies, that we require money. There are many things that we consider important in life that we would never pay for. Some of these, we feel, would lose much of their value if payment were required. So refusing to pay for something can, in some cases, be seen as a value judgment. We should not consider economic exchange as a form of expression. At least not without considering the larger system within which this exchange takes place. We are not free. When we started charging money for our art, which coincided with our switch to using videogames as a medium, we were hoping to establish a self-sufficient community with our audience. We called it a punk economy. We make games, players pay for their production, and nobody else needs to be bothered. We quickly found out, however, that if we wanted to charge a similar low price for our work as other videogames – which is important to us because we want to offer the public a choice – we would not be able to support the cost of production. Our audience was simply too small. In order to find a bigger audience, we would need to slow down, to experiment less, to work with subject matter that was popular, and in a style that pleases large amounts of people, etc. And we found that we owed it to this new medium that we go out there and explore, and to our society that we are sincere as artists, that we offer people an alternative for demeaning commercial consumer products. We have been able to do this thanks to private and governmental arts funding. Real independence is an illusion. But this way, we are only partially dependent on the market, and only partially on non-commercial funding. This may change, of course. Neoliberalism still seems to be on the rise and the arts are paying the price for the onslaught it causes in the economy: Banks fail, so arts funding gets cut. Welcome to the modern world. So we are continuously on the lookout for alternative ways of getting our work made. We do not exclude experimenting with more commercial designs that can be carried by a market. Nor do we exclude crowdsourcing. What matters is that we do this work, this research, this exploration. This is much more important than money. We will find a way. Dawid: To finish, let’s try to peek a little more into the future. Where do you see yourself and the declarations you have made in 2006, in the Realtime Art Manifesto, on the medium’s scene in few years from now? What would you advice to the new authors that want to use games as a way to express their emotions and tackle important issues? In Poland, for instance, games are now a hot topic business-wise, they are regarded by many as a fashionable product to be designed and sold. How to encourage more people to put first the aim to create a meaningful experience for their audience? How to convince them to choose games and not the older media that already support and understand the importance of the artistic approach for years? I feel that emerging authors may need some council and boost from, forgive the expression – art-game veterans – such as Tale of Tales. Michaël: Due to the precariousness of funding our kind of production, we tend to plan quite a while in advance. So if all goes well, we already know more or less what well will be working on in the next couple of years. What will happen to our work in the field is much harder to predict. It feels to me that at this point, the idea has been more or less accepted that it is OK to make videogames that are not exactly games, but more artistic explorations. Being who we are, to us this means that we can move on to something else. Not wildly different perhaps, but there’s a lot we still want to experiment with. People who are really interested in using the medium of videogames for their art, should find a way to reduce the impact of commerce on their practice. Videogames are a very commercial medium, dominated by the world’s experts in capitalism (USA-UK-Japan). So it’s very easy to get sucked into this logic that the most important thing is money, both in terms of funding as in terms of sales. Given that winning is an important aspect of many games, people tend to extend their love for winning to areas outside of the games: business. Find a way to work on your art that allows a minimum amount of stress about money. Your art is far more important than any financial concerns. But do try to offer your games to the audience on the games market. Because they need to be offered a choice. Go where the people are. Do not even consider making your games exclusively for gallery exhibitions and festivals. In terms of the actual work, artists shouldn’t feel cramped about the medium or any particular form requirements. They should by no means feel obliged to respect game traditions, or even like videogames. If artists are attracted to the medium of videogames because of their game aspects, they should be discouraged. There really is enough of that already. We need new contributions from different fields. So if you’re a writer, think of videogames as a form of writing. Use the videogames medium to make your writing more interesting, more adventurous, more impactful. If you’re a theater or film maker, make theater and film in the videogames medium. Et cetera. Use the medium for your own purposes! Don’t be its slave. The best way to convince other artists to consider videogames as a medium is to make interesting art with it. Or, if you’re an engineer, to make better software interfaces for artists to do their work. If you’re an engineer, don’t try to be an artist. Just make tools for artists instead. But listen very carefully to their wishes. They might be complete luddites when it comes to technology, but they know very well how to make art. And it’s your responsibility to enable them. Dawid: Thank you for your time for Jawne Sny. All the best for the future projects and relations with the audience. Hopefully there will be also something to count on from the part of the critics. Michaël Samyn: The artist- engineer? PS. More about Michaël’s ideas, opinions and problems on his blog about „Bientôt l’été” development. For most of the past year it has been updated daily. Tagi: 8, Auriea Harvey, Bientot l'ete, Fatale, in English, Michaël Samyn, Tale of Tales, The Endless Forest, The Graveyard, The Path, Vanitas. As the author of the critical blognote that sparked the aforementioned discussion here on Jawne Sny, I feel obliged to answer :-). This is a great interview, Michael, and I’m glad to know some more of your thoughts and background of your work. I think the interview also clarifies a bit your understanding of some notions (art, author, game, videogame…). But I must admit I’m still not convinced :-), especially when it comes to your distinctions of what is and isn’t art. I simply cannot agree with such strict, a priori statements like „consumer products are not art” or „works of art do not have a registered trademark after their title”. I don’t quite get why should we need such a strong separation of artistic and financial values, and I can think of many examples of works of art which are artistically worthy and financially successfull at the same time. (And I also have a definitely broader definition of art – and I think that „art” doesn’t automatically mean „good art”). I also think that gameplay (as set of rules, mechanics, challenges etc.) doesn’t stand in the way of art. And criticism of videogames should have several tasks. I agree that critics should promote and encourage experiments and new things in the medium, but I’m deeply convinced they should also be able to make insightful inquiries of blockbuster games. Overlooking „Dear Esther” would be a terrible mistake; but it would also be a terrible mistake to overlook how „Bioshock” tackles the topics of ideology and morality or how „Assassin’s Creed” series deals with urban exploration and history enactment. And yes, it’s still important to criticise the shortcomings of plot or gameplay of these games (and there are oh, so many), but I think a good videogame critic should be in constant dialogue with mainstream. Closing ourselves in ivory towers won’t make anyone any good, I think. Still, despite being a fan of some mainstream game franchises (the horror! ), I’m a dedicated fan of Tale of Tales, and „Bientôt l’été” waits for some free hours tonight or tomorrow :-). @Piotr – I’ve been thinking a lot about „Bioshock” lately, and the result is more and more disappointment with the game. I don’t see profound or interesting philosophy in it – the depth is just about similar to that of what Ken Levine is criticising, i. e. Ayn Rand’s writings, and that is not really much of a compliment. Rapture is not a really well thought out distopian society – it’s visually suggestive, but otherwise not really interesting. A good distopia is always about a network of relationships between citizens and social classes, and when most citizens are reduced to ADAM-thirsty zombies, there’s not much stuff to discover in this respect – a lot of stuff to shoot dead, though. Finally, by far the best thing about „Bioshock” (which I really admire) is how it leads the player to the discovery that he is being manipulated. The problem is, after this discovery the second part of the game comes, where you basically do the same stuff you did before, led forwards in the same way. First, they say something important, and then add „But what the hell. We’re here to mash buttons, not philosophise, eh?”. It’s one of the stupidest things I’ve ever seen in a game that has something important to say. And it compromises „Bioshock” as a whole. I don’t see the harmful effects of game designers shutting themselves in ivory towers – in the long run it might become alienating, but so far has been quite refreshing in the all too monotonous gaming landscape of the 2000s. I appreciate lots of things games did in their history, but I do not think appreciating it is a necessary condition for making new games, and, indeed, that you miss a lot by not looking at the past of gaming. Sometimes you miss more by looking at it. There is an important difference between the artist and the critic – it’s the critic’s first duty to know and appreciate the history of the discipline they are writing about. As for artists – many historical examples show that sometimes it’s better to shut out the past and do your thing. Michael&Auriea are artists, and, as you admit, they’re doing a darn good job. And, may I say, Dawid, you did a darn good job on this interview, too. Oh well, actually I won’t die for defending the depths of „Bioshock”, I just don’t think it’s appropriate to dismiss it just because it’s a shooter in its core mechanics. And as for shutting in ivory towers – I agree that it’s generally not harmful when game designers do it, I just argue that it’s unacceptable for game critics :-). I’d agree with Paweł that „Bioshock” is rather weak example of a consumer work functioning as art, but we also have games like „Mother 3”. I still believe that rejecting modern gameplay elements instead of fully embracing everything that’s good about them is not a good way to go for an artist, and „Mother 3” is a perfect example of a videogame that is both mechanically complex and thought-provoking. Does it have (relatively) complicated combat system? Yes, but it doesn’t make it any less of a masterpiece, on the contrary – without it the grand finale of Lucas’ story wouldn’t be as powerful as it is right now. I am convinced Shigesato Itoi is the best writer that has ever worked on any video game and it’s a shame that so far only one of his games has been official release in the West. In my opinion, his games are more than enough to prove that consumer works can be art, and that one doesn’t have to reject modern gameplay conventions to express himself as an artist. Itoi fully embraced jRPG gameplay he loved to express his ideas, fears and thoughts – does it make him less of an artist? Is his message worth less than message of „Dear Esther” just because he wanted people to have fun while exploring his world? @ Piotr and Paweł – I also do not agree in details with Michael’s distinction of art and not-art (but I understand he made some generalizations), since some artists find the way of commercializing their art through corporations, though they still care mostly about the artistic substance. The closest example to the interview is “Journey”, that has a neat “TM” at its title. However, if we still decide to distinguish “good” and “bad” or “high” and low” art, we need to define how we do that. And THAT’s what Michael’s Notgames blog note was about – about distinguishing the artistic value. Sure, we can pay attention to both “Bioshock” and “Dear Esther”, write about them both, remain in a “dialogue”, but we ought to decide why one is artistically superior, especially that they are so culturally and emotionally distinct. Especially at this moment in the videogame history, when mainstream still receives overwhelmingly more “critical” attention. Not being able to distinguish – this is closing of oneself in an ivory tower of comfort and ignorance – it is always easier to say “I value both (all?) games to the same extent”. I think nobody really wants to value all games to the same extent – I would just like the critics to formulate opinions based on close examination and convincing arguments rather than on prejudices about the genre or cultural register of certain games. And I can’t really agree with the emotions being a key to art (though I understand that’s it a rather personal than theoretical guideline for you). Soap operas also generate emotions (and sometimes even pretty complex), while some rather highly valued works of traditional genres base on biologically primitive emotions (as Aronofsky’s „Requiem for a Dream” and „Black Swan”, not to mention the whole lot of war movies and horrors). Also, personally, I’m too often reluctant to feel any emotions supposedly connected with acknowledged masterpieces to accept „art is about emotions” definition. @ Piotr – It’s not only a question of solely a type of emotions, but also a method (not only a form – also sequence, amount, proportions etc.) of passing them form one person (an author) to another (a recipient). The soap operas sometimes generate quite interesting emotional responses but most often do it by quite monotonous, simplified and pretentious method. The same way as Bioshock by the way – some interesting emotions and philosophical information but emotionally very primitive and monotonous method of presentation. However – when we shift the method to match the purpose of emotions, the effect can be interesting artistically. For example I agree that in Heavy Rain the type of emotions is often quite “soap opera-like”, but I argue that you feel these in a different way, than when just looking passively. You suddenly consider (or I consider, to be exact) them much stronger and more authentic, at least in the exploration and dialogue sections of the game. The same love (not a primitive emotion), that seems “boring” in soap operas, becomes more vivid and important in some scenes in Heavy Rain. Again I agree that we should scrutinize all pieces carefully, to find the interesting stuff. But that wasn’t what Michael’s blognote’s main meaning was about! Have a look at the original note again – he says exactly what you are saying – that we should find the outstanding value in Assassin’s Creed and put it as the most important. Earlier, on the same blog, Michael was discussing what he likes in Bioshock 2, let me cite: “BioShock 2 presents one of the most convincing narrative contexts for a First Person Shooter game”. The thing is that Dear Esther has more of these values in Michael’s opinion than the two other games, and that’s why it is artistically superior. I absolutely do not agree that in Aronofsky’s movies the emotions generated in the audience are biologically primitive. There is love, compassion, empathy. The fact that simple things are shown on screen, and characters feel e.g. fear, addiction or are hurt, does not mean that the same is being felt by the audience! It is rather basic fact about all artistic media. Again, it is the matter of why the author shows you something – he can show the same dead body to touch people or to scare them. And I do not get a lot of interesting afterthought after Bioshock, since fighting, that takes some 80% of the gameplay, is not done to cause any more interesting emotions than tension, fear, fun. I get much more of such afterthought after playing Arma 2 campaign “Harvest Red”, where there is also quite a lot of fighting, but to show more of a realistic war – how bad, ugly, chaotic, boring, unrewarding it is. So, maybe if you can define what is most important in art for you, as I think every critic should do, I will be able to understand, accept and maybe even admire, why you similarly artistically value Bioshock and Dear Esther. You’re right about me overlooking the part about „Assassin’s Creed”, my bad. So, as for what’s most important in art for me, here’s the confession: I don’t know. The more I discuss the definitions of art, the more I realize that I don’t exactly follow any of them in my personal aesthetic (?) pleasures and valuations. Does it make me a less worthy critic? Perhaps; but I just feel the obligation to support my every aesthetic opinion with arguments whenever I write a longer critical text. And the arguments may change from one work of art (?) to another as they have different values and appeal to different emotions. For example, I still can’t quite explain why „Katawa Shoujo” visual novel made a huge positive impression on me. (I hope to figure it out in couple of weeks though, and I plan to write about it on Jawne Sny ;-). So, as I don’t have my one single personal definition of art, I quite often criticise those who think their definitions should be universal. And there’s my point in my criticism of Michael Samyn’s stance: I think his notion of art is oppresive, because it links the artistic value with genre (=core mechanics of the game). „Bioshock” will *obviously* be less artistically successfull than „Dear Esther” just because it’s a shooter. And he tells me to „respect [Dear Esther] as superior”. And to be perfecty clear: I think „Dear Esther” is one of the best things that ever happened in videogame medium. I adore it and I really do think it’s way better than „Bioshock”. I just oppose to this oppresive way of argumentation. I think the „superiority” (which I understand as local, „in my opinion”, and not essential and inherent) needs to be justified with something else and more than a basic mode of interaction or a topic. So, yes, indeed, I don’t like to be forced to say „thechineseroom, the great studio it was”, even if I really think it’s true ;-).